It’s hard to think about anything heavy to eat after Thanksgiving. After a big holiday meal like yesterday, I prefer a simple hamburger from one of our nearby burger places. But I’d be willing to eat other food as well…as long as it’s not turkey and someone else is doing the cooking. Soon, I’ll head back into my kitchen. Later this afternoon, perhaps, since these “just right” cookies my friend Ann makes have been on my mind. Moist and a just little tart with dried cherries, these cookies taste as good as they smell. Part of their simplicity is that the ingredients are so basic that they are likely stored in your kitchen cupboard. And as they bake and cool on my kitchen counter, they fill the house with an aroma of simple everyday goodness. Turkey and cranberries, as good as they are, are foods I enjoy but once a year. It’s food like hamburgers and oatmeal cookies that remind me that the best of life is not found in holiday feasts or in those special days where we receive some nice certificate to hang on our wall or hide in our safe deposit boxes; yet, isn’t it ironic that we remember the times when certificates change hands — like for a marriage or the birth of a child or a college graduation — and forget that the best of real life is found sandwiched in between? These everyday cookies remind me of all that is good about everyday life. Bake and serve them for those certificate days of celebration or on one of the many, many days in-between. From my life to yours. Sift together the flour, baking soda and cinnamon. and set aside. Cream the butter and sugars until fluffy, about 3 minutes. Mix the beaten egg in thoroughly, then stir in the vanilla. Add the dry mixture. Then mix in the oatmeal and then the cherries. Give it a final mixing. Refrigerate, covered for 1 hour. Preheat oven to 350 degrees. Pam a cookie sheet. Place walnut-size pieces of dough on the prepared sheet, allowing space for cookies to spread. Bake for 10 minutes, or until set. Too funny, Janell . . . guess what Alex and I had already planned on making this weekend, before I read your blog entry???? 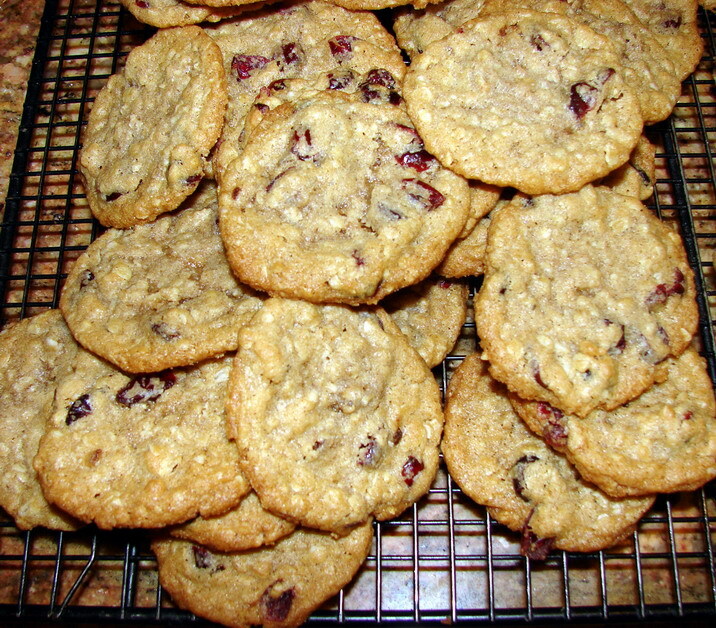 Ann’s Dried Cherry Oatmeal Cookies!!!!! We love those cookies!!! Does Ann know that you have a blog? I need to email your blog’s link to her, I think. Too funny AND too good for my own good. I hope you and Alex enjoy your cookies as much as Max and I did ours; I had three and Mr. Max had a dozen when I wasn’t looking. That dog…. the French did invent the buffet serving line, after all! Yes, Ann knows about the blog. Sometimes I pick up the phone and just need a dose of Ann. I told her about the blog so that she could tell Bernice, who has always been an encourager of my writing. Bernice, of course, as well as Ann, are just encouraging women overall. We were lucky to circle up with these gals in that Companions group — seven years ago now. Just yesterday I ordered dried cherries and so on from American Spoon Foods up in Michigan. I also bought some dried cherry/nut mix with almonds and pecans. I’m thinking….. maybe some of that cherry nut mix with almond flavoring substituted for the vanilla. Stay tuned for kitchen updates! Oh – and I had the best conversation with the gal taking the order. I told her I was spending so much money with them because they’re a family business and Michigan based, and it was the one way I could think of to do something directly for Michigan. She said they’re hearing from a lot of folks this year who are buying more than they otherwise might, just to help out. If a whole country would just stop with the made in wherever trinkets and buy American, who knows what kind of difference it might make? Good idea on both fronts. Both sound like recipes for success. Or at least, a little more everyday goodness. I agree, we were very lucky. I am suffering from a serious case of missing our Companions Group of ladies right now. I have never found another group like our Companions Group. I have found lovely ladies who mean a lot to me; but, none have had that wonderful mix of ages that our Companions Group had. Mattie was the baby of our group and I think Vicki was the eldest, or perhaps Betty R? Not sure I just know that it was truly a blessing to share time with all of you. It was such a good age range. Somehow I missed replying to your comment of Dec. 2nd. My apologies. As for missing our Companions group, the grief wafts in and out of my life as well. I’ve come to terms with the thought that this particular group at this particular point in my life may have been a once-in-a-lifetime grace, intended to last me for all the remaining days of my life. If so, then it has. There was enough love in that group to continue to nourish my days here without a similar group of women in my life. So far. Yet, even if we were to bring back that same group of people, it wouldn’t be the same as we are not the same. We will find new women to love and share life with. But I imagine we will do so standing on the shoulders of these women from our shared past. And we honor them and God as we do.